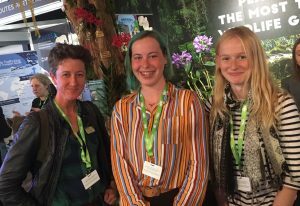 Chloe and Jess made the most of the opportunities to discuss illegal trade in orchids and sustainable alternatives with a wide range of scientists and policy makers at the conference yesterday. 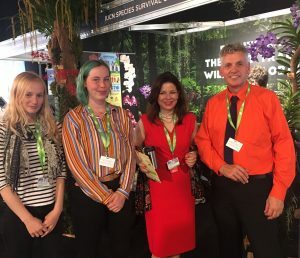 Therese Coffee MP and Parliamentary Under-Secretary of State for the Environment and Rural Life Opportunities was fascinated to hear the students perspective on the illegal trade in orchids. Professor Dahlia Conde, Director of Science at the Conservation Science Alliance lives in Denmark but comes from Mexico and was interested to consider Mexican opportunities for orchids in education. 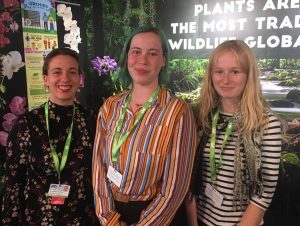 Ruth Bone (Kew) and Sarina Veldman are both working on sustainable orchid production to protect terrestrial African species used as a food in Zambia and were particularly interested in the girls’ laboratory work. 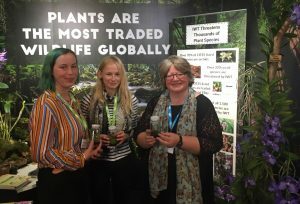 We expect a number of new initiatives to come from our new partnerships and look forward to sharing our experience with visitors to the British Orchid Show and Congress on November 3rd and 4th. I wonder… Is it too much to hope that DEFRA might cut the ridiculous red tape and expense that makes the import of orchids from legitimate sources outside the EU virtually impossible and therefore drives the illegal trade through eBay and other sources? I hope not. Unfortunately by removing any amount of red tape it will make it much easier for illegal plants to make it into the system. Ultimately the illegal trade through eBay, Facebook and I’ve just seen Etsy flag up as well, will be much cheaper than legally imported plants. It will also offer plants that are hard to grow and propagate more readily to people who want them. A lot of the paperwork that DEFRA has to manage for importing plants and animals is being imposed as a legal requirement from much higher up than the UK government, such as CITES, Which they will be able to have little if any influence on. Debbie how do you know that illegal trade of orchids happens through eBay etc?